Mount your tripod on wheels for some mobility. They are light weight and shipped in a reusable, lockable tote. Recommended for use on a level flat surface. 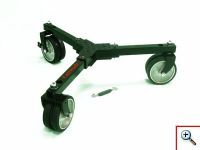 Two of the three sets of wheels have the ability to lock the Tripod Wheels in position.